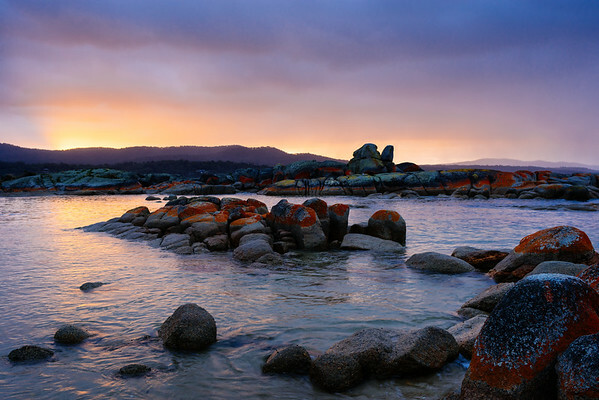 Images from the stunning island of Tasmania, located off the southern coast of Australia. 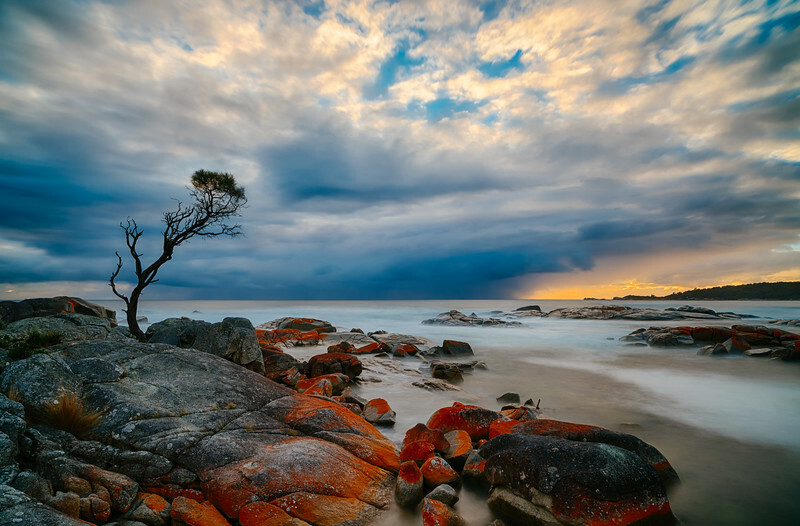 For a photographer, no trip to Tasmania is complete without a visit to the Bay of Fires region on the east coast of the island. The area is known for the deep red and orange lichen growing on the rocky shoreline. The lichen clings to the rocks and boulders for miles and miles (or kilometers and kilometers) of shoreline, withstanding the constant pounding of waves and the flow and ebb of the tides. I had the good fortune to spend several days in the is wonderful area during my April 2014 trip to Tasmania. I arrived at the Bay of Fires following the overnight ferry from Melbourne and a several hour drive across the state. Despite being tired, I was so excited to be in Tassy that I headed out to scout a few locations in anticipation of photographing sunrise the following morning. But, as the sun began to set, the sky turned a wonderful purple highlighted by the yellow and orange hues of the sun having just fallen below the nearby ridge line. Moving quickly, I set up my tripod, attached the correct lens to the camera, and got a few shots before the color left the sky. What a great way to start a trip. I was one of several photographers who work up early this morning to capture the sunrise of Tasmania’s Bay of Fires, known for the red and orange hues created by lichen on the rocks along the shoreline. This tree is photographed frequently, as it has seemingly grown straight out of hard rock and survived the oceans continual onslaught. This early autumn morning was a wonderful experience. While there were other photographers about, we all had ample space and the peacefulness of the moment was wonderful. I watched as the sun rose behind an offshore storm, but was treated to a nice display of colors as the sun crested the horizon and illuminated the far shore and the sky overhead. What a way to begin a photography trip! A few years ago someone saw my image of New Zealand’s Moeraki Boulders at sunrise and commented that it looked like an alien world. That image was a long exposure which smoothed out the ocean waves while the light in the minutes leading up to sunrise created a dramatic blue hue throughout the sky with tinges of pink. I can’t help but think of an alien ocean when I see this image captured in April 2013 during my visit to the Tasman Sea coast of Tasmania. While the Bay of Fires area is know primarily for the red lichen covered rocks that dot the coast line, there are also other incredible scenes, such as this one at Eddystone Point, near the lighthouse. I arrived mid-afternoon, after a long and bumpy ride through logging roads, to find myself alone at the lighthouse and the entire surrounding area; not another person within sight. I hiked around the area for a while, attempting to see where I could set up for both a sunset shot that evening and then sunrise the following morning. Eventually I ended up on a stunning beautiful beach, with fine white sand the consistency of powdered sugar. The tide was coming in and many of the rocks were beginning to be covered by the chilly water. I set up in a position to capture this movement of water, but moments later saw the moon had quickly risen low in the sky, just above the distant clouds. With the moon moving into the portion of sky where the deep orange of sunset melds into the light blue and purple of the coming night, the scene was one I couldn’t resist. One eight second exposure was all that was needed. Shortly after that, I sat down on a rock slightly above the tide line, pulled out some dinner, and enjoyed a peaceful meal while watching and listening to the waves crash against the soft beach. 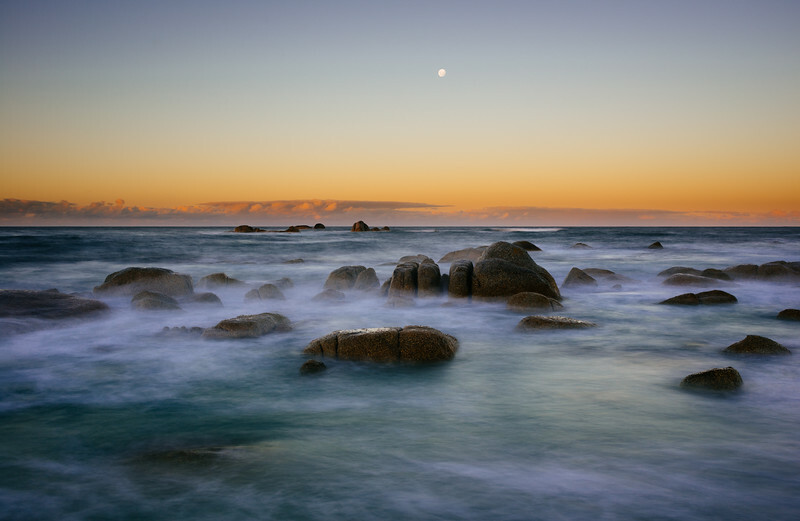 I had several mornings at the Bay of Fires to photograph sunrise, and I made good use of my time there. There aren’t actually that many angle from which to photograph this amazing tree that grows out of the lichen covered rock, but I tried a few while there. The sun rose this morning in a quite undramatic fashion. But, shortly afterwards it went behind this cloud bank, and the rays started to stream through. I loved the way the rays hit the ocean while the upper parts of the clouds was irradiated a bright golden hue. There are so many variables that are beyond ones control when doing landscape photograph while traveling. a good amount of pre-trip research will help minimize those variables, but weather is almost always out of the control of the photographer. However, during my visit to Frecinet National Park in Tasmania, weather worked in my favor. I knew I wanted to photograph Wineglass Bay, and that the best place to do that was from the lookout. Without hiking off trail, which given the cliffs in the area is a bad idea, this is the best (and easiest) place to set up a tripod. As I got into position, the rain came. It didn’t look like much would come from my attempt to photograph the Bay, but after 30-45 minutes, the clouds began to part. That’s when i was treated to a rainbow forming on the hill opposite me. I was hoping the rainbow would become visible higher in the sky, but that was not to be. Instead, I watched as the lower portions of the rainbow depend in intensity and reached down to the tree covered slope above the beach. I quickly captured several shots to create a multi-row panoramic of the scene. The rainbow didn’t last long, but long enough for me to capture what I needed. I went back the next day hoping for a repeat performance, but, as is the case with the weather, it was completely out of my control, and the sky was cloudless. Not from from Freycinet National Park in Tasmania, is Friendly Beaches. I’m not sure why it is “beaches” instead of just one “beach,” especially given that it is just one long sandy beach on the Tasman Sea. But, that is neither here nor there. Friendly Beaches are very friendly…just how friendly? Well, a nice little wallaby decided to hop out of the bushes and meet me at my car as I parked, and then even let me pet it before I walked down to the beach. Friendly Beaches was also quite deserted when I was there, which was perfect. I was able to stroll along the beach (something I usually don’t like to do) and just enjoy the solitude while the sounds of crashing waves surrounded me. 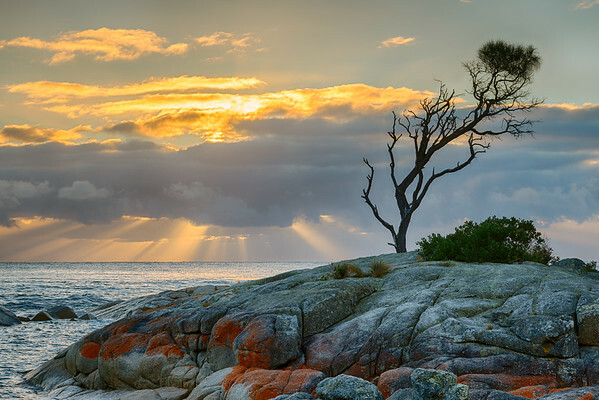 I visited this area a couple of times while at Freycinet, including one morning to photograph sunrise. The actual sunrise didn’t live up to my hopes, so I shifted to Plan B: photographing the power of the Sea as it surged around this outcropping of rocks. 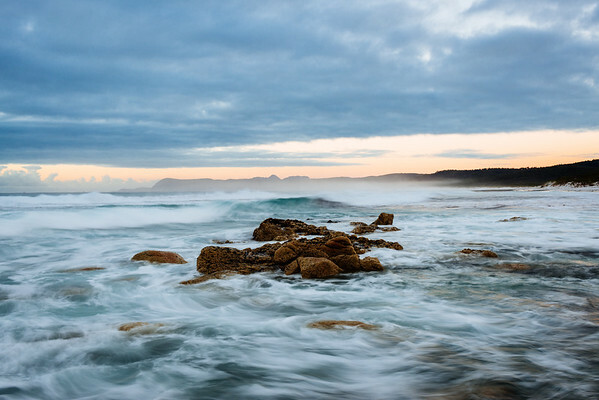 Using different exposure lengths, I tried to capture both the power and movement of the ocean. I came closest to that with this image, which I love just because of the wave just above the rocks that is in various stages of cresting and crashing. Near Freycinet National Park in Tasmania, lies Friendly Beaches. These beaches didn’t come up when I was doing trip research, but were recommended to me by the people who ran the cottage I was staying at. I’m so glad they did. I visited first one afternoon and had the entire beach to myself. I walked up and down the white sand for probably three hours enjoying the solitude and the sounds of crashing waves. The following morning I returned to my pre-scouted location and captured this shot shortly after sunrise. 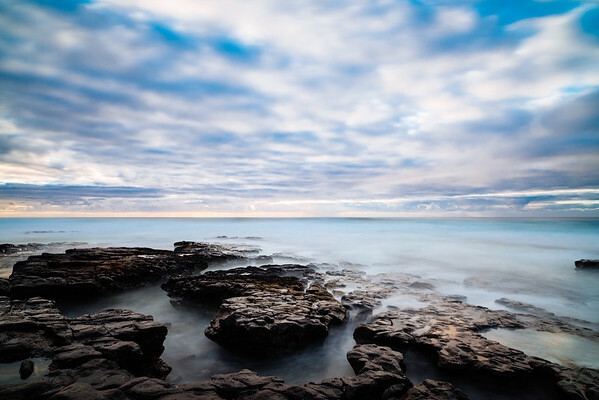 I used a long exposure to smooth out the ocean surface and create the ethereal feeling created by water moving over and among the rocks. No one else was on the beach as I was photographing there that morning. So, after the sun rose higher in the sky, I stepped back from the rocks and water, sat down on the beach, and enjoyed a simple breakfast while watching the waves roll into shore. 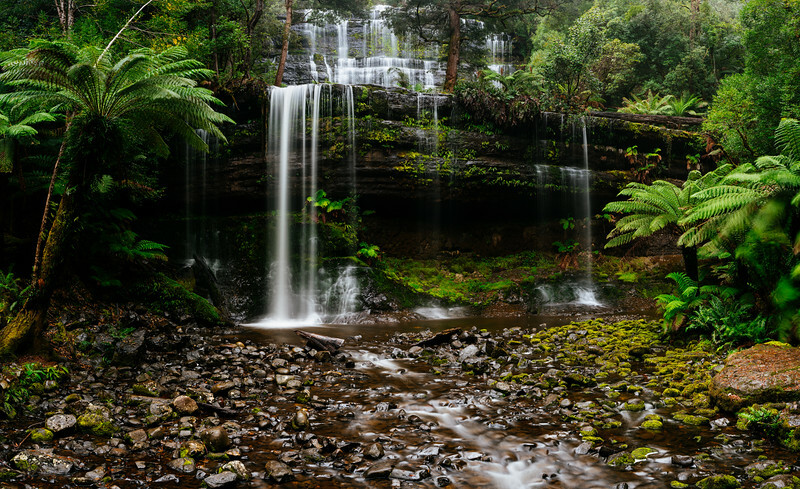 I had seen pictures of Secret Falls, near Hobart, Tasmania, while preparing for my trip to the island State located off the south coast of Australia. Alas, while there were general directions to its location, the directions were vague, to say the least. I tried to find it my first day in Hobart, but struck out. Then, the second day I returned ready for a longer more through search, and quickly came across another photographer trying to find it as well. We trudged up a hiding trail that went along a small stream. But, there was no indication of a waterfall, nor the type of terrain that would hold a waterfall. Then, a tiny side trail branched off of main trail; I can hardly call it a trail—a tiny strip of slightly cleared dirt is more accurate. 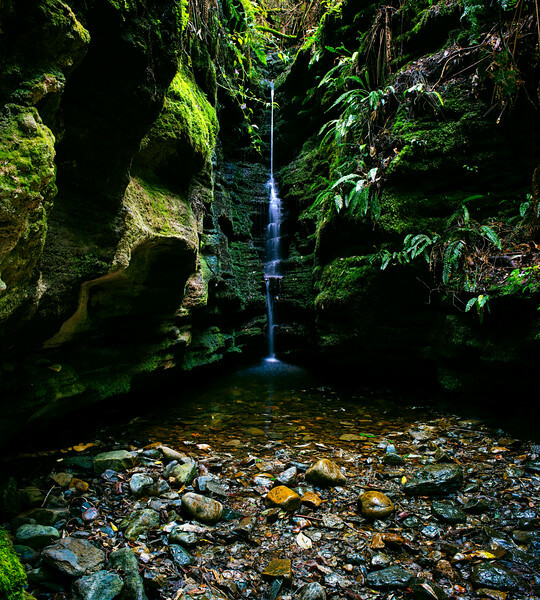 Carefully climbing down the step and wet dirt, brought us to a small gully and Secret Falls. Unfortunately, with little rain the past few days, Secret Falls was running out of steam. And, the area is small enough that two photographers is one too many. But, we made do, and were both able to capture some great images of the Falls. Trying something new, and given the tight confines of the area, this is a 25 image focus-stacked panorama I captured that day. It was amazing how, despite being 15 minutes from downtown Hobart, and just 30 seconds of a main hiking trail, this area had the feeling of being secluded by miles and miles of dense forrest. I look forward to getting back here some day. 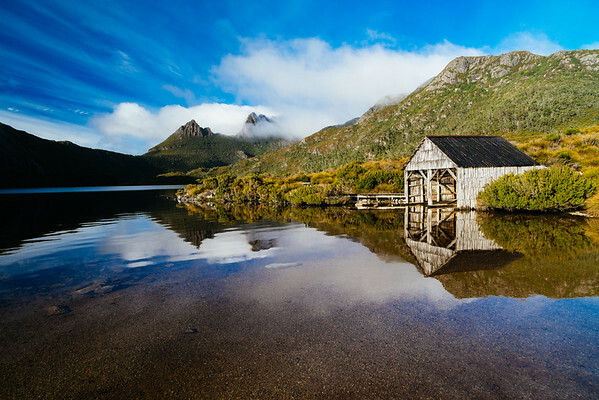 Dove Lake at Cradle Mountain - Lake St Clair National Park in Tasmania, is probably one of the most photographed sites in all of Tasmania. It’s an icon image, especially when the weather cooperates and the water is still and glass-like. The problem becomes attempting to capture a unique image—there are only so many angles of view and places to set up a tripod, and they all tend to lead to the same image…including this one. That’s not to say I don’t like this image; I do. But, at the same time, it isn’t unique. Beyond the way the clouds are moving in on the peak of Cradle Mountain in the background, this image is like thousands of others taken each year; many probably from the exact spot I set up my tripod. Even as I was taking this image, there for five or six other photographers nearby. All that said, I enjoy seeing this image. I remember how cold it was on this early autumn morning, how the clouds changes quickly as a storm was brewing and moving in, and how it was so peaceful. What a wonderful morning. This must be the most photographed tree in all of Tasmania. 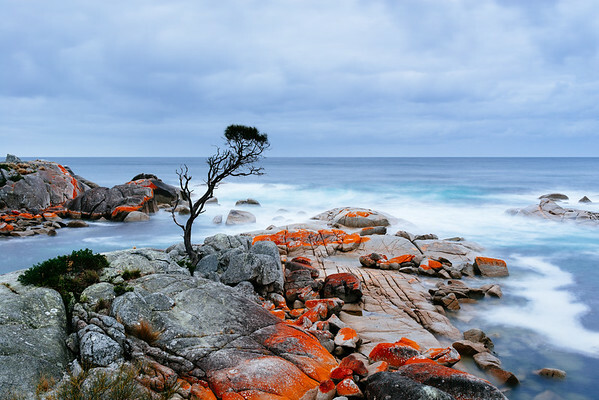 A visit to the Bay of Fires, on Tasmania’s east coast, is not complete without seeing and photographing this lone tree that has managed to not only grow out of the rocky shoreline, but has also survived against the ocean’s power. This evening sunset shot didn’t provide the most dramatic of sky’s, so to compensate I used a long exposure to flatten out the water and create the dreamy smoothness. What a great evening I had when I captured this image. Sunset was coming up in about an hour, I was hiking along a remote beach in Tasmania, and not another soul was around for miles. I was exploring the coastline around Eddystone Point to find a good spot to capture sunset, and as I walked along the beach I noticed how the wind had created this elegant ripples in the sand. 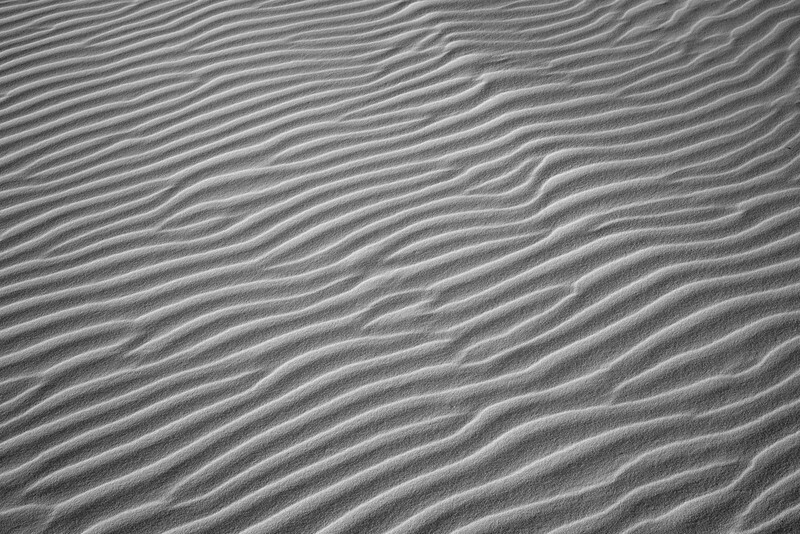 With no one else around to disturb and wreck the ripples, I started looking for a set that would make a good abstract image. I wanted enough conformity, but also some of Natures natural chaos. I found exactly what I wanted in this image. After capturing this image, and finding the best spot for sunset, I sat down on one of the large boulders scattered along the beach and had an early dinner while I waited for sunset. What a perfect evening! What a great evening I had when I captured this image. Sunset was coming up in about an hour, I was hiking along a remote beach in Tasmania, and not another soul was around for miles. I was exploring the coastline around Eddystone Point to find a good spot to capture sunset, and as I walked along the beach I noticed how the wind had created this elegant ripples in the sand. With no one else around to disturb and wreck the ripples, I started looking for a set that would make a good abstract image. I wanted enough conformity, but also some of Natures natural chaos. I found exactly what I wanted in this image. After capturing this image, and finding the best spot for sunset, I sat down on one of the large boulders scattered along the beach and had an early dinner while I waited for sunset. What a perfect evening!